We have our second cup game of the week on Saturday when we welcome our friends from Perth, St Johnstone to Palmerston in the last 16 of the Betfred League Cup. It was a memorable day for Queens fans the last time the two sides met back in February 2015, when goals from Derek Lyle and Gavin Reilly gave us a two - nil win to knock the then holders out of the Scottish Cup. As he aims to steer Queens into the quarter finals of the league cup this time around, Manager Gary Naysmith has been looking back on this weeks games and ahead to the tie. "At the end of the game last Saturday, I felt we were a little unfortunate not to get a point from the match after a very strong second half performance against Dundee United. I thought we were excellent in that period of the game but we gave ourselves too much to do after a disappointing first forty-five minutes. It's far too early to pay much attention to the League table and there is certainly no panic within the squad, but at the same time, we want that first Championship win under our belts as soon as possible. However we are a week away from our next league fixture and this weekend we can all look forward to our Betfred cup tie against St Johnstone. The game comes on the back of our Irn Bru Cup match away to Stenhousemuir. Firstly it's great to be into the next round but it was good to give the younger players like Jack Leighfield, Connor Murray and Owen Bell some game time as well as giving debuts to Declan Tremble and Daniel Harvey. They along with the experienced players gave a professional performance and they have all given me something to think about in terms of team selection for the game against Saints. To have five players involved against Stenhousemuir who have come through the Clubs Academy highlights the good work that Eddie Warwick has been doing with the younger players. I will always give youngsters an opportunity when the time is right and when I do, it's up to them to make me really take notice and push for a regular starting spot in the team. Our reward for the win in midweek is a home tie against Northern Irish Premier League side, Crusaders. It will be something different and a tie that we can look forward to nearer the time. We have a lot of connections with St Johnstone, Tommy Wright has helped me a lot with loaning players during my time in management and I will always be grateful to him for that. It will also be nice to see Jason Kerr, Zander Clark and Chris Kane again and I am sure they will get the warm welcome from our supporters that they deserve. They were tremendous players for us and I am glad to see that they are all doing well back at St Johnstone. However, friendship will go out the window during the game, as like every game we play, we want to win. St Johnstone have made the same start to the season as ourselves with a draw and a defeat from their opening two games but they will have taken confidence from their share of the spoils with Hibernian last weekend where they played really well. I can't stress enough, that they are a very good Premiership side, but hopefully using the homework that we've done there are areas where we can cause them problems. We will defiantly be taking the game to St Johnstone as we want to make it through to give the players a boost of being in the last eight of the competition and to generate income for the club. I made a few changes to the team against Stenhousemuir, no disrespect to them but I did have one eye on the game this weekend and by giving some of the players a rest, they'll be refreshed and ready to go. Josh Todd and Dan Harvey will miss the game along with Darren Brownlie who is out long term but everyone else is fit and available for selection". We are expecting a decent travelling support for the game, they'll be located in the BDS Digital (East) Stand, where sections six to eight have been set aside for them. Turnstiles three and four will be in use for them to gain entry. The away stand catering outlet will be available for use of St Johnstone FC supporters. Catering is also available in the Arena café to ALL supporters where a full menu is available before kick-off. Entry to the game is by ticket only. The usual ticket offices will be open for both sets of supporters. There is a ticket booth situated adjacent to the turnstiles at the BDS Digital Stand for Away fans. In addition, supporters who choose to park in the Arena car park have access to a ticket office within the Arena. Please note that the away ticket both is CASH ONLY, should spectators wish to pay by card then they should purchase their tickets at the Arena ticket office. Adult £18, OAP's £10, U-16's £5 U-12 Free, Adult accessible £8, Concession accessible £5, U16 accessible £3. Wheelchair access for away supporters is on the south side of BDS Digital stand. There is a lay-by on King Street for vehicles to drop their passengers for flat access to the ground. Disabled parking is available on the north side of the BDS Digital Stand or at the Arena car park. The cost of entry of 1 personal assistant is included in the price of the accessible ticket. There will be on-street parking restrictions so it's suggested that buses/minibuses drop off their passengers in Terregles St/King Street and thereafter park on College Mains road just off the roundabout with the A76 on the town bypass (adjacent to Curry's/PC World, as the other side at Aldi is the access road to the ambulance depot and is extremely busy). Pick up should be the same location. There are no known roadworks in the area that will cause any delays. 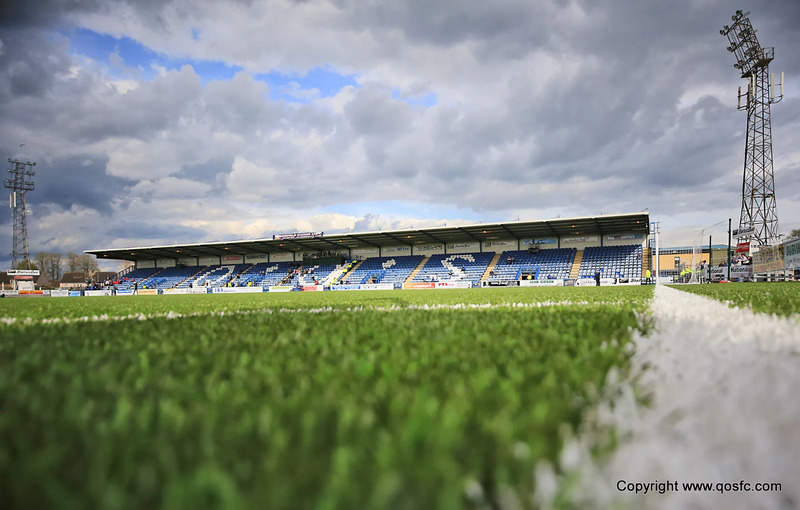 Just a reminder that QOS have adopted a robust search policy for spectators entering the ground to ensure that ground rules and regulations are strictly adhered to especially in relation to pyrotechnic devices and controlled containers. Palmerston Park is a non-smoking venue, this includes e-cigarettes and other such devices. Stewards are empowered to eject spectators who disobey these rules. All spectators are requested to abide by our unacceptable behaviour policy. The Saturday club for Kids will be on at the Arena, no need to pre-book just register at the table prior to it starting at 1230. Two hours of coaching, fun and lunch along with match ticket for £10 (£8 for junior blues) ! Kick off at Palmerston, 3pm.